This was a very easy to make recipe and absolutely delicious. I usually use lemon and not extract, but the extract really gave it a nice lemony flavor. It would be wonderful with berries and cream as well. This recipe is a keeper, enjoy! · 3/4 cup organic sugar or stevia equivalent. Cream butter, cream cheese and sugar or stevia together, mixing well. Add eggs, one at a time, beating well after each. In a separate bowl, mix almond flour with baking powder. Add egg/butter mixture to flour a little at a time while beating. Add lemon and vanilla extracts. Pour into greased 9″-10″ springform pan, bundt pan, or 9″ round cake pan and bake at 350°F for 50-55 minutes until toothpick comes out clean. 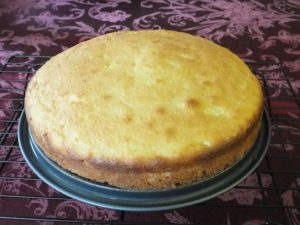 You can change flavors for this cake by using different extract flavors. Do you think it would be possible to make this without dairy? I’m not sure. You could use coconut oil for the butter but not sure what would sub for the cream cheese.